Are you considering having a baby with a non-anonymous sperm donor? Or, are you a man considering sperm donation and want to be known to your future child? 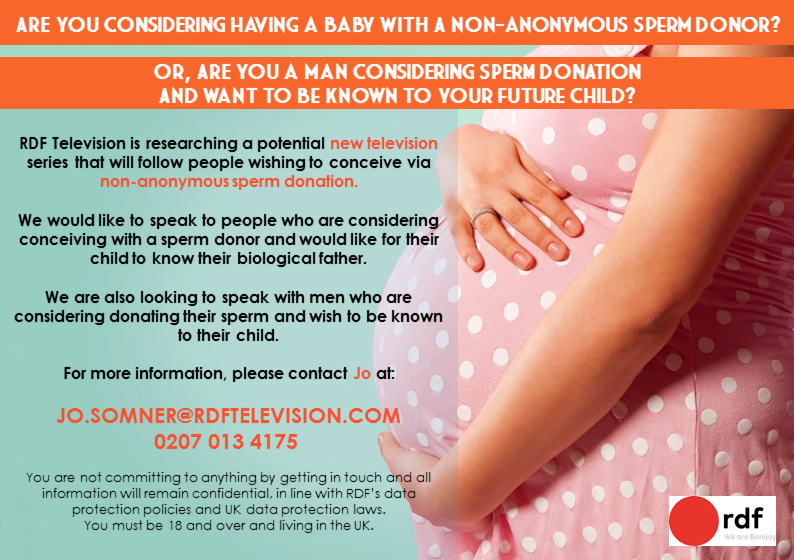 RDF Television is researching a potential new television series that will follow people wishing to conceive via non-anonymous sperm donation. We would like to speak to people who are considering conceiving with a sperm donor and would like for their child to know their biological father. We are also looking to speak with men who are considering donating their sperm and wish to be known to their child. You are not committing to anything by getting in touch and all information will remain confidential, in line with RDF’s data protection policies and UK data protection laws. You must be 18 and over and living in the UK.